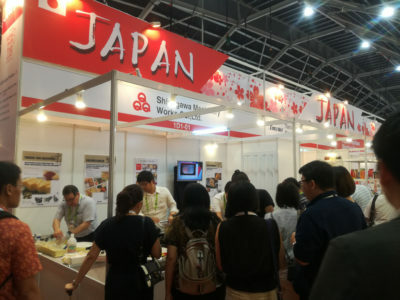 Exhibitions | Shinagawa Machinery Works Co., Ltd.
Over the four-day period from Tuesday, April 24, to Friday, April 27, 2018, we exhibited products at Food & Hotel Asia 2018 at the Singapore Expo. Our booth attracted a large number of visitors, and we’d like to thank everyone who stopped by. We exhibited compact egg roasters designed for use in a retail setting. Questions and requests concerning manufacturing tests and other topics should be directed to the office nearest you. (A limited number of test units are available, and information is provided on a first-come, first-served basis. Thank you for your patience.) We look forward to answering your inquiries and hosting you at our company. 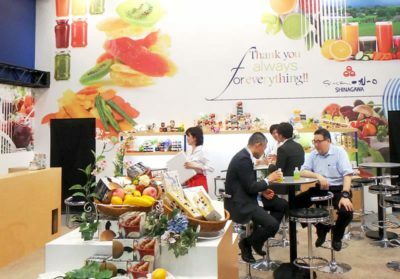 We exhibited at Chubu Pack 2018. Over the four-day period from Wednesday, April 18, to Saturday, April 21, 2018, we exhibited products at Chubu Pack 2018 at the Nagoya International Exhibition Hall. Our booth attracted a large number of visitors, and we’d like to thank everyone who stopped by. We exhibited a range of confectionary products, including rice cake machines and compact rice cake cutting machines. Questions and requests concerning manufacturing tests and other topics should be directed to the office nearest you. (A limited number of test units are available, and information is provided on a first-come, first-served basis. Thank you for your patience.) We look forward to answering your inquiries and hosting you at our company. We exhibited at MOBAC Show 2017.